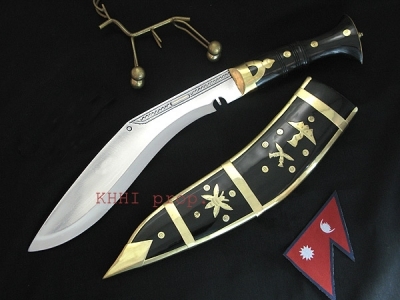 now with KYDEX sheath; targeted for foot soldiers in frontiers to serve military mission, operation, execution and even exercises..
A modern day improved kukri knife designated for military personnel mobilized in various locations and in desperate situations to accomplish their mission. 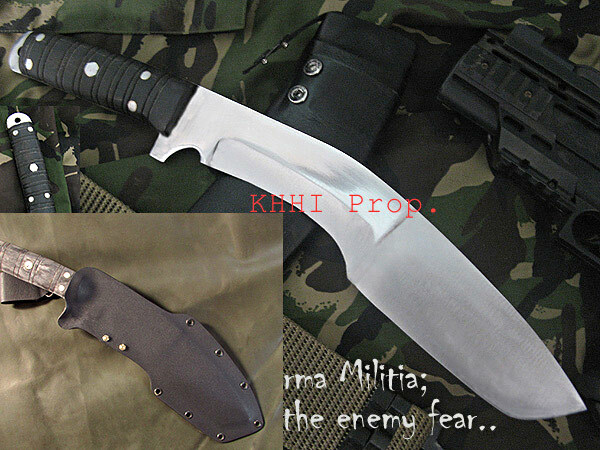 Xtrema Militia is a new innovative and inspired knife introduced by KHHI targeted for foot soldiers in frontiers to serve military mission, operation, execution and even exercises. 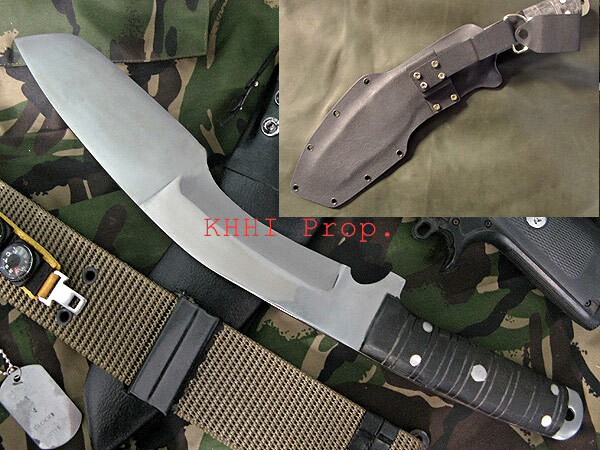 The knife is intended as a wearable utility gear for a soldier that can be used as an assault knife and as a defensive tool at the same time. The knife is a cutter, slicer, hacker, stabber and a digger. Every detail in the knife is crafted in a creative and combative way in order to assist the user efficiently; like the dual panel within a single blade designed for cutting, slicing and digging – a built in steel guard to protect fingers all the time – a cylindrical full flat tang multiple riveted horn handle having ridges for durability and much easier grip - a lanyard hole to facilitate a wrist cord – and a compatible *KYDEX sheath that is very easy to carry and draw supported by a detachable frog. Let The Enemy Fear.. hunt them down!! 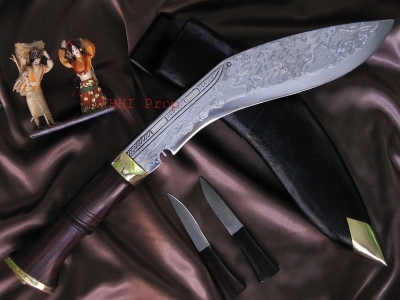 The Extrema is another beautiful blade, although in the beginning I did have a few issues with the chemical coating (which was admittedly added by my request) after using an oil to try and protect the edge, it took on a somewhat viscous texture and proved difficult to extract from the sheath. However after a thorough cleaning it now functions flawlessly and makes for an ideal multi-purpose survival tool.